The Notting Hill producer and Hackney rappers talk about how they formed, their new EP ‘The Exercise’, their sound, the UK scene and the future. How did The Foot Soldiers meet and where are you guys based? We met about four years ago at Lewisham college while doing a djing and production course. Grade is from W11 Ladbroke Grove/Notting Hill area and Mr and Impact are from Hackney. Who decided on the name of the group and why was it chosen? Grade was in the army and in the Welsh guards and he was talking about it one day that they are known as The Foot Guards so we just came up with The Foot Soldiers on the spot and it had a good vibe to it and it just stuck. How long did you spend working on your current EP, ‘The Exercise EP’? We’ve been working on material for years and have a lot of tunes, so some of the tunes are old ones we like and some are recent ones. There wasn’t really a set period. We write all the time so expect a lot of material in the future. Can you tell us a bit about some of the tracks on here and how they came about. ‘This Is Not An Act’ is a recent one and Grade was into doing a rocky guitar thing and wrote a lot of beats with distorted guitars and we really liked the vibe and in the raps we were just trying to get across that this is us. Take us for who we are. We aint trying to be something we’re not. On ‘It’s A New Day’ Impy brought Bluetorian around to Grade’s and we just did it in about three hours and it seemed to work well. The rest, there’s no real story of how we did them. We just did them. What artists and producers have inspired you to get to this point and make music yourself? We are all inspired by so many people, a lot of whom are American. We listen and follow all the British stuff and have done for years. We are into anything from Abba to ZZ Top so there’s probably too many to mention, but if we were to name names, then it would be Production: Eric Sermon, The Alchemist, Timbaland, Just Blaze , DJ Premier, Dre. Rappers: (Nas, Busta, Mos Def, Redman, Wu Tang, Klashnekoff). Who do you think has the UK hip-hop scene on lock right now? We all think the man that’s got it is Klashnekoff. We all love his album, but Skinnyman is up there too. But there’s so much good stuff. Ty, Rodney P, Roots Manuva, Blak Twang… but the scene has got its genres starting to happen within uk hiphop like the Eski thing and now the grime thing but the guys above are the ones we personnally think represent british hip hop. Did you consider trying to get signed or always intend on going the independant route with your music? We must have sent out CDs to every record company in the UK. Didn’t get any feedback and to be honest probably glad we didn’t because we’ve learnt a lot about ourselves, through trying to do our own thing, and we love what we do. Signed or unsigned, I think we have more control on what we do even if we are skint. The independant thing is how the hiphop culture started and has worked for so many artists that it’s probably gone full circle now and lots of groups will be doing the same until the record companies see and hear what a buzz they create on their own, and will be first in line to snap them up. Do you agree that your production is closer to the line of grime than the average UK hiphop beat? We try to not think of genres which we are similar to. We just do our own thing. If people want to say we sound like this type or that, well that is up to them, but I think we sound different from a lot of stuff and when you hear our other stuff, people will say it’s quite dubby or American sounding. I do not think it’s grime. Our beats are half the speed of grime. Probably more like a UK hiphop beat. How do you rate all the small scenes and styles of music shooting out from the hiphop rap music tree? I think the UK scene is great. There’s loads of groups and we just see the ones in London when were out and about, and you got Bristol, Birmingham, Leeds and Manchester all turning out good music so the more the better. It’s got to be a good thing. It’s about time the UK got respect for what it does. The industry needs to get more involved now, but its coming. What generally comes first, the beat or the lyrics? Or does it all happen at the same time? Grade makes all the beats on his laptop and mpc and will give us a CD when we go to see him so we will take the beats home and just pick the ones we are feeling and write to them. Then go back to Grade, record them… and by that time he will have done another CD for us and it just goes on like that. What have you guys got planned in terms of future projects? At the mo we got the EP out but we’re just trying to get people listening to our stuff, so will have another EP out in a month or so. Grade is doing a mix CD with his production and American rappers on it. Also, he’s done a dub reggae DJ mix cd. We’re doing a mix CD with American nstrumentals and our raps on. We want to get as much of our tunes out as possible. We’ve done a lot of tunes and we are always working on new ones. Are you going to be taking the EP on any live tour dates and what are they? We’re not taking the stuff out on a tour but will be performing in London at different places and news of those places can be found on our website. Have you got any promotional messages or shout out’s you’d like to make? 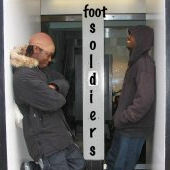 Check out the official Foot Soldiers website.